In theory, the process is first defined, then appropriate methods selected for implementation, and finally the appropriate tools set up. Tools have already been established in the company and these are used, even if they may not be ideally suited. Solutions from previous projects are reused, even if they are not ideal. It’s the easiest way to keep it that way and continue to use it in the new project. A method is first introduced by trial and error, and a tool is used which seems sufficient for first experiments. Once data has accumulated, the tool will not change anymore. If the process has changed, the methods and tools have not been adjusted accordingly. There are many more reasons why in practice processes, methods and tools are not always optimal are coordinated. There is a great potential for improving efficiency here. Tim Weilkiens from oose and Andreas Willert from Willert Software Tools have developed the EEE method, which is used to analyze the situation in a two-day workshop and to identify and eliminate weak points. 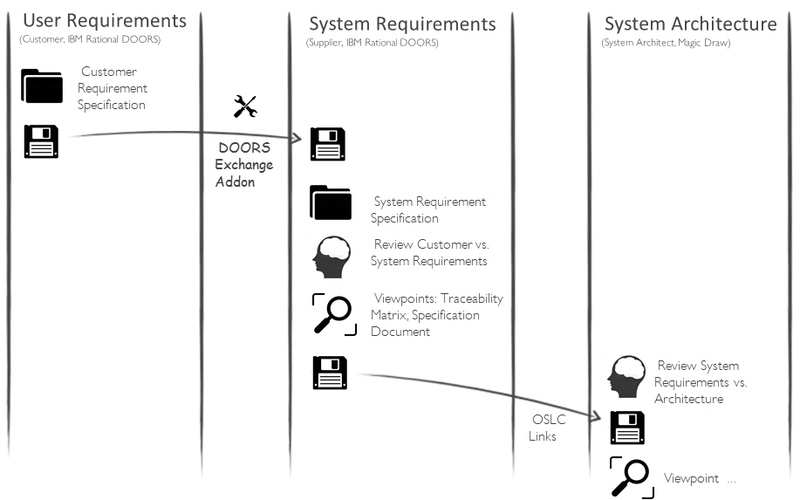 It is not about completely transforming processes, methods and tools, but rather optimizing the bottlenecks. Often great effects can be achieved with small changes. Many companies are already very well equipped with tools, but for historical reasons, these are in some situations are not optimally used. An engineering step could perhaps lead to the goal more efficiently with a different method and a tool change is not necessary for this. Of course, it can also turn out that another process step can be helpful with other methods and tools. Slimming can also be an option. The question ‘Why are we doing this?’ is rarely asked, and ‘Historically grown’ is often the answer. It makes sense to consider the purpose. In addition to processes, methods, and tools, the most important component is often neglected. These are the people with their skills, preferences, and peculiarities. The EEE method also takes people into account and especially their communication at the interfaces of the individual disciplines. The entry into the analysis is the recording of the actual situation. The development process with stakeholders, the methods and tools are recorded in the EEE Tools Roles Methods Matrix. Therein, the roles represent the vertical axis, the tools the horizontal axis and the process steps or methods fill the cells of the matrix. Each column and row transition indicates potential risk for efficiency loss. Column transitions indicate method and tool breaks, line transitions indicate human interfaces (potential communication lacks). Next, the transitions are evaluated. Is the transition efficient or a bottleneck? The transitions with bottlenecks are prioritized and considered more closely. The transitions of the process steps for which optimization potential has been identified will now be discussed in detail with the ‘EEE Process Step Definition Diagram’. The following points are entered in the swimlanes: Goal of the process step, needed source artifacts (data), viewpoints, automation steps, target artifacts, artifact (data) conversions. 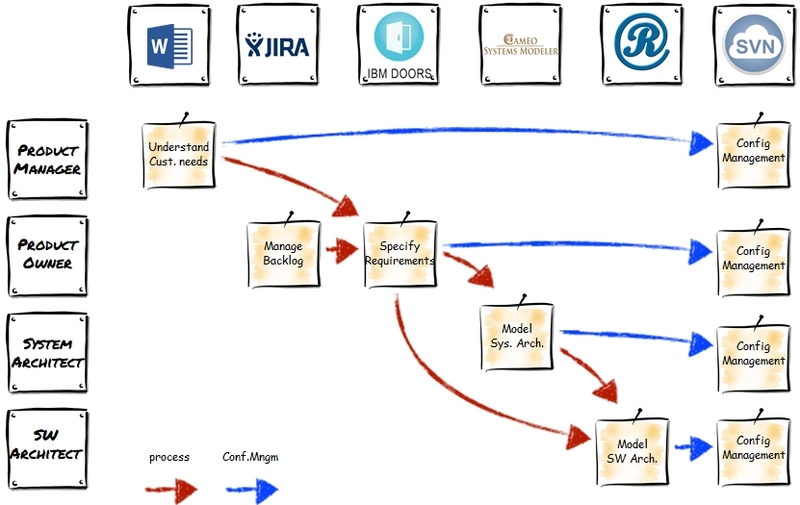 If the resources are visualized in the diagram, the process steps are much easier to analyze and be optimized. Based on the EEE Process Step Definition Diagram, the individual process steps are now optimized. For example, it may be that artifacts for a process step can only be imported into the tool with great difficulty. The reason for the choice could be a viewpoint used in the tool. Maybe another tool can display the viewpoint sufficiently. Very often you can also import or export artifacts automatically or replace the import and export with links. Often we come across situations in which over time (for historical reasons, by an acquisition of business divisions, outsourcing, etc.) has shaped a heterogeneous tool landscape. The goal is to stop this growth and to harmonize the diversity of tools in the company as a whole in order to reduce costs, effort for training, times for administration and integration costs. The results of the EEE method and in particular the EEE Tool Roles Methods Matrix supports to set the constraints for the use of tools and methods. in the EEE analysis are recommended. Alternatives can be allowed and the use of combinations that have not proven to be practicably forbidden. 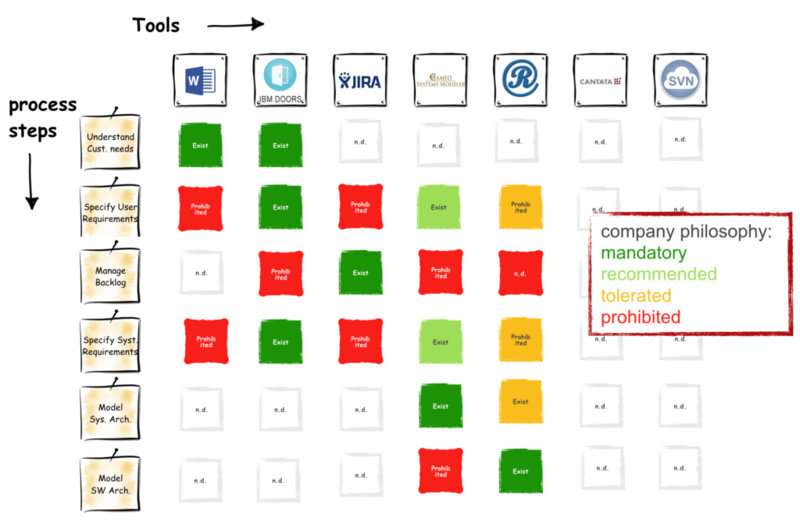 It creates a company tool policy matrix as a guideline in the company. Over time, this can prevent wild growth in the area of ​​methods and tools.